While Q4 signals the holidays and sweater weather, it also indicates the arrival of flu season. Every year the flu affects as many as one in every five Americans. A flu outbreak in your office can not only lead to costly insurance expenditures and loss of wages for your employees, but the Center of Disease and Control (CDC) estimates the flu costs business owners over 10 billion in productivity every year. Once the influenza virus wreaks havoc on your workforce there is little any employer can do to stop its spread. 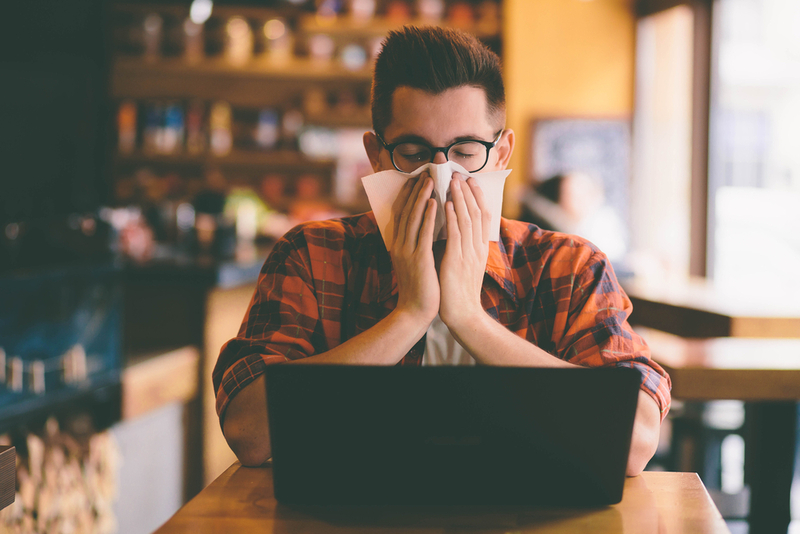 Be prepared for this year’s seasonal outbreak: we’ve put together a few quick tips to ensure your company is prepared for the flu virus before it cripples your workforce. Encourage Vaccination Did you know that individuals who have been vaccinated miss less work, perform better, and are less likely to spread contagious illnesses? The best way to keep the flu out of your workplace is to encourage your employees to get vaccinated. However, juggling full-time careers and lives outside the office can often leave employees little time to prioritize vaccination. Team up with the HR department to coordinate community vaccinators or neighborhood pharmacies to host on-site vaccinations. On-site vaccinations not only take the ease off of your employees’ busy schedules, it shows employees you care. Shut the Flu Out Besides promoting vaccination, one of the best preventative measures is to stop the flu virus from ever entering your office. It has been known that many employees still show up to work despite experiencing flu symptoms and as a result, expose their colleagues to contagious viruses. Encourage those who are beginning to exhibit symptoms to take a sick day or work from home. Review your company’s paid time off policy for sick days and make sure that it provides enough time off for your team. Your employees would rather work sick than miss a day’s worth of pay or use a vacation day – so encourage them to stay home to rest and feel better! Losing one employee for a few days is beneficial in comparison to jeopardizing the health of your entire workforce. Educate Employees on Hygienic Practices As business owners you not only lead by example, but also through educating your staff. During flu season it is imperative that your employees are made aware of the impending risks of exposure and how to avoid the flu virus. Although it may seem obvious to some, host an office meeting on the importance of hygienic practices. Displaying posters on proper hand washing techniques in bathrooms will also remind employees in high contact areas to thoroughly disinfect. Advise staff to wipe down their workstations, telephones, door handles, and any other surfaces that could be a hot spot for germs. Though informative meetings may seem mundane, they play a key role in keeping your staff aware. Maintain a Sanitized and Stocked Office When the flu hits, ensure that your office is well equipped to defend itself. Provide your employees with the necessary hygienic supplies such as hand sanitizer, disinfectant wipes, tissues, and antibacterial soap to combat the spread of germs. Decreasing your office’s risks through administering more frequent cleanings of highly trafficked work areas like bathrooms, kitchens, door handles, and desks will also lessen the risk of exposure. By providing a stocked and sanitized office, employees are given the resources needed to combat contracting the flu virus. Encourage Employees to Maintain Healthy Lifestyles Many employers and employees do not realize the increased threat of compromised immune systems during Q4. Encouraging your employees to maintain healthy lifestyles is essential in keeping contagious viruses like the flu at bay. Keep your office kitchen stocked with things such as orange juice, Emergen-C, and healthy snacks. Motivating employees to be well rested, hydrated and promoting healthy diets are great ways of keeping your staff’s immune systems in tip-top shape. While the spread of the flu virus might be inevitable, it is vital that every company is taking preventative measures to maintain the health of its workforce. Following these tips and encouraging your workforce to get immunized will go far in boosting your company’s odds in fighting off this season's flu virus. Emplicity understands that HR Outsourcing should be simple and meaningful. As a Professional Employer Organization (PEO), we strive to be a great partner in supporting your business. If you would like to request more information on how we can assist your needs, please reach out to us at 877-476-2339. We are located in California – Orange County, Los Angeles, and the greater Sacramento and San Francisco area.